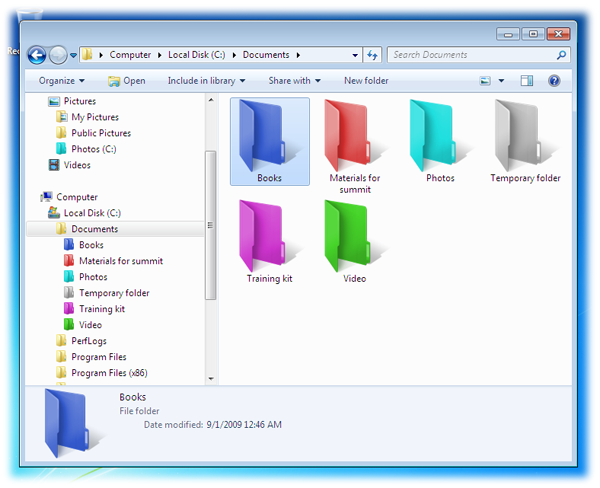 FolderHighlight is a small but powerful tool that changes the visual appearance of the folders in your PC. With FolderHighlight you can change folder color directly from Windows Explorer! We receive about 80% of all information through the eyes, and the same 80% of our memories consist of images. When you are browsing through dozens of visually similar folders, you are not using your vision to its full extent and thus your activity is less effective than it could be. But if some of these folders have a different color, they will catch the eye faster than you read their name. This way you can easily differentiate between folders and browse much faster, because you are using your vision much more efficiently. Even though Windows already allows you to customize folder icons for this purpose, FolderHighlight is a much easier to use as it integrates into the Explorer right-click menu, so you can quickly change folder color without having to go through additional dialogs.